Is it a bird, is it a plane… Is it a NEW WEBSITE? Congratulations to Connections for Business on the 2013 Fast Tech Awards! Once again, the South Florida Business Journal has ranked Connections for Business as one of the fastest-growing technology companies in South Florida. 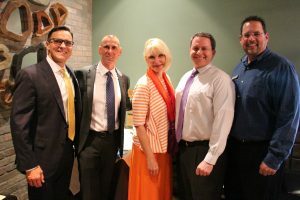 Connections for Business is now a proud sponsor of the Florida Institute of CPA's FICPA. Reflections on 1976: "We’ve come a long way, baby!" Since the ‘70s, the IT industry has come a long way. When Byte Magazine was featuring cover stories on the cassette tape – Bill Bennett had an idea. After having the privilege of receiving mentorship from two key business leaders in corporate roles, he went on to start his own business ventures. These ventures eventually led him to his true passion – technology. Things were happening in the world of computers, and Bill decided that it would be an excellent business model to help other business owners manage their technology. Connections for Business is proud to have received the Fast Tech award from the South Florida Business Journal. Fast Tech recognizes the 25 Fastest Growing Tech Companies in South Florida. The awards were presented at a breakfast event held Oct. 18 at the Westin, Fort Lauderdale. The event was presented by BGT Partners, with corporate sponsor Daszkal Bolton LLP and technology sponsor Comcast Business Class. If you’re looking for stress free network management in South Florida, you’ve come to the right place!